Our next presentation, geared for parents of children with and without autism, focuses on strategies to ensure that older children and teenagers are equipped with the skills and confidence needed for a successful transition to young adulthood. Adulthood brings increased independence, new relationships and responsibilities, and the need to navigate new work and educational environments. Come join us as we discuss important considerations for parents as they shift from raising kids to supporting them as they become young adults. Drawing from current research and her experience at the UCSB Autism Center, Dr. Krasno will provide tips and tools for empowering parents and children to work collaboratively to jointly navigate this significant life change. Presenter: Anna Krasno, Ph.D., is the Clinical Director of the Koegel Autism Center and a licensed clinical psychologist. She oversees the clinical training and supervision of the Autism Center staff and is responsible for designing and implementing clinical service initiatives. The next presentation in the monthly UCSB Koegel Autism Center’s Autism Seminar & Discussion (ASD) Series will focus on the development of autism symptoms in infancy and toddlerhood. Come join us as we discuss the early warning signs that parents, caregivers, and educators should know. This presentation will include video examples to highlight behaviors that may indicate concern. Participants will also learn about a new clinical initiative to support infant social development that will be offered by the Koegel Autism Center. Presenter: Liz McGarry, M.A., is a doctoral candidate in Counseling, Clinical and School Psychology (clinical emphasis) at the University of California, Santa Barbara. She is also a graduate student clinician and researcher at the Koegel Autism Center. Her research interests involve the development and dissemination of evidence-based interventions to promote early social engagement in infants and toddlers at-risk for ASD. Liz has developed an online Pivotal Response Treatment training program for parents to learn about and implement treatment strategies at home with their child. The monthly Autism Seminar & Discussion (ASD) series is made possible through collaboration between UCSB's Koegel Autism Center and the Santa Barbara Library to bring highly engaging and informative content to the local community. It will take place the first Tuesday of each month. The next presentation in the monthly UCSB Koegel Autism Center’s Autism Seminar & Discussion (ASD) Series will focus on supporting the well-being of parents and caregivers of individuals with autism. Come join us as we discuss the unique parenting challenges that arise when raising a child with autism. This presentation will encourage resiliency in caregivers by providing practical self-care strategies as well as emphasizing the importance of supportive communities. Participants will also learn about local resources including the ongoing Parent Education and Support Group offered by the Koegel Autism Center. Presenter: Anna Krasno, Ph.D., is the Clinical Director of the Koegel Autism Center. She oversees the clinical training and supervision of the Autism Center staff as well as designs and implements clinical service initiatives. Dr. Krasno is a licensed psychologist and obtained her Ph.D. in Counseling, Clinical, and School Psychology (clinical emphasis) from the University of California, Santa Barbara. She completed her pre-doctoral internship at Lucille Packard Children’s Hospital at Stanford University. Her post-doctoral training was completed at Child Abuse Listening and Mediation (CALM) in Santa Barbara, CA. The next presentation in the monthly UCSB Koegel Autism Center’s Autism Seminar & Discussion (ASD) Series will focus on strategies for improving the Individualized Education Plan (IEP) experience, for parents, self-advocates, and educators. Geared towards parents/self-advocates and professionals alike, this presentation will describe practical strategies and ideas to facilitate a positive IEP experience. Specifically, information will be presented to address common parent barriers/concerns, as they relate to the IEP process, as well as recommendations presented, regarding ways in which the educational team can work to ensure parents 1) understand the IEP process 2) trust in the IEP process and 3) are active members in the process. This hour-long presentation will be followed by a Q & A session. Presenter: Sarah Pelangka, Ph D, BCBA-D, E.S.C., is a Doctor in Special Education, as well as a Board Certified Behavior Analyst - Doctorate, and a credentialed special education teacher. Dr. Pelangka’s IEP journey commenced 14 years ago, when she began attending her sister’s IEP meetings. She is now the owner and primary advocate for Know IEPs? 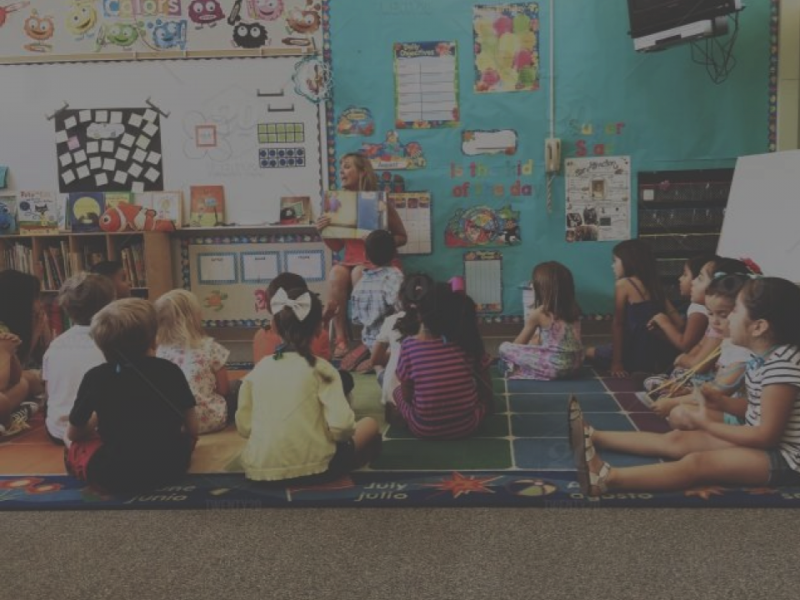 Our mission is to ensure a collaborative and trusting experience ensues, between families and the district, allowing for a positive IEP experience. 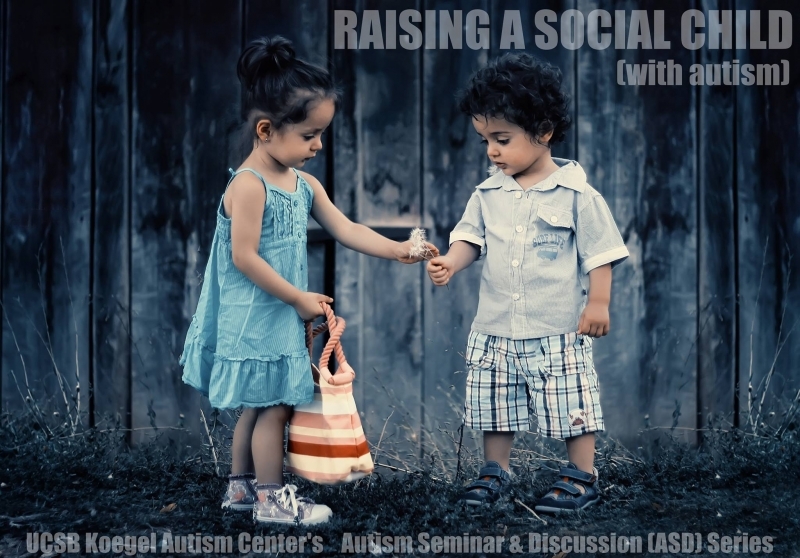 The next presentation in the monthly UCSB Koegel Autism Center’s Autism Seminar & Discussion (ASD) Series will focus on strategies for providing socialization opportunities for school-aged children diagnosed with autism spectrum disorder in inclusive school and community contexts. Geared towards parents and professionals alike, this presentation will describe practical strategies and ideas based on current research for facilitating social interactions within inclusive school and community settings and activities. This hour-long presentation will be followed by a Q & A session. Presenter: Kelsey Oliver, M.A., is a doctoral candidate at UCSB in Education with an emphasis in Special Education, Disabilities, and Developmental Risk Studies and a clinician at the Koegel Autism Center at UCSB. Her research interests include developing practices for educating and supporting parents of children with ASD and establishing interventions that support inclusive education of students with ASD in schools. Introducing UCSB Koegel Autism Center's free monthly Autism Seminar & Discussion (ASD) Series. Our center has collaborated with the Santa Barbara Library to bring a new presentation the first Tuesday of each month. Our first one hour presentation will be February 6th from 6:30 to 7:30 pm followed by a Q&A session in the SB Library's Faulkner Gallery. 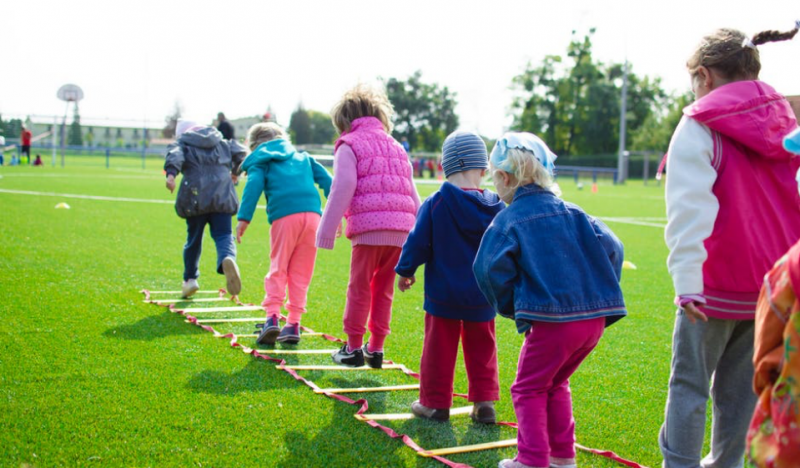 This first presentation will focus on practical strategies to motivate and empower toddlers, children, and teenagers to seek out peer connections. Drawing from the latest research on friendship formation and maintenance, this presentation will highlight strategies that parents, school staff, and other professionals can implement across community settings to jumpstart social relationships for youth with autism. Presenter: Dr. Vernon is the Center Director of UCSB’s Koegel Autism Center, an Assistant Professor in the Department of Counseling, Clinical, & School Psychology, and a licensed clinical psychologist. His research interests focus on the development of socialization interventions for individuals of all ages with autism spectrum disorder. Are you interested in learning more about early signs of autism spectrum disorder? Please join the Koegel Autism Center team for a free workshop to learn about early signs of autism between the ages of 0 to 5. This workshop will take place on November 8th, 2017 from 6 to 8pm at the Koegel Autism Center. Community resources and referrals will be provided. If interested, please click HERE to register. If you have any questions about the workshop, you can reach us at (805) 893-2049 or autism@education.ucsb.edu. 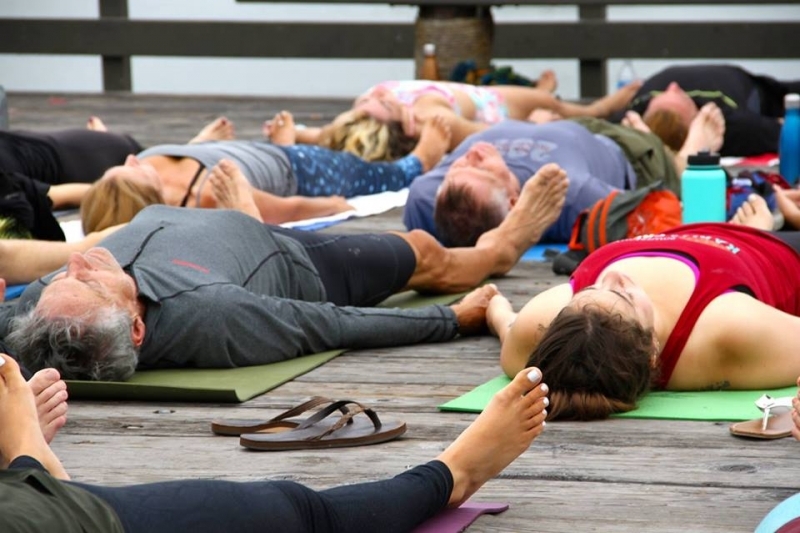 Power of Your Om's final yoga fundraiser for the Koegel Autism Center will be held this Sunday at 9am at Stearns Wharf. The class is donation-based, so bring a friend, get a great workout, and give to a great cause. 100% of the proceeds from this class will go to supporting the Koegel Autism Center!